CRISPR/Cas9 technology is a powerful tool for creating gene knock-ins and knock-outs. Using the ribonucleoprotein (RNP) system for delivering CRISPR/Cas9 has many advantages over the traditional plasmids or virus based delivery methods. Studies show that sgRNA has better stability than crRNA:tracrRNA when duplexed with Cas9. Is your sgRNA pure enough for CRISPR experiments? Choose HPLC-purified sgRNA to avoid data inconsistency resulting from sample impurities! *Deliver in as short as 8 business days. GenScript CRISPR RNAs (crRNAs) are short 36 nt RNA oligonucleotides which contain a short 20 nt sequence which guide the CRISPR/Cas9 complex to genomic targets for gene editing. GenScript CRISPR/Cas9 trans-activating crRNAs (tracrRNAs) are 67 nt RNA oligonucleotides which together with the crRNA and Cas9 nuclease, form the activated CRISPR/Cas9 ribonucleoprotein complex. For annealing tracrRNA and crRNA. Human HPRT (hypoxanthine phosphoribosyltransferase) is a housekeeping gene commonly used as positive control for testing CRISPR/Cas9 cleavage efficiency. Pre-validated human HPRT crRNA, which after duplex with tracrRNA, can be used as positive controls for your CRISPR experiments. 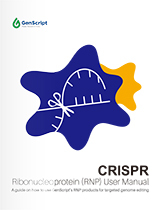 Human HPRT primer mix for assessing CRISPR cleavage efficiency via PCR. GenScript offers pre-duplexed human HPRT crRNA:tracrRNA as positive controls for your CRISPR experiments. HPRT (hypoxanthine phosphoribosyltransferase) is a housekeeping gene and commonly used control has already been pre-validated for efficient CRISPR cleavage. The kit comes with an HPRT primer mix for PCR analysis. CRISPR/Cas9 system can be delivered into cells in many forms, including plasmids, lentivirus, adeno-associated virus, and ribonucleoprotein (RNP) complexes. CRISPR/Cas9 ribonucleoprotein (RNP) system are composed of Cas9 protein and either a single guide RNA (sgRNA) or a CRISPR RNA (crRNA) : trans-activating crRNA (tracrRNA) duplex. The crRNAs are 20 nt RNA oligonucleotides designed to be complementary to a genomic target. crRNA sequence design utilizes standard gRNA design principles and sequences can be easily selected from the GenScript gRNA database or customized using the GenScript gRNA design tool. The tracrRNAs are 67 nt RNA oligonucleotides which together with the crRNA and Cas9 nuclease, form the activated CRISPR/Cas9 RNP complex. A sgRNA is a single RNA oligo that contains both the crRNA sequence, which can identify target genomic sequence, and the tracrRNA sequence, which can form complex with Cas9 protein. When either a sgRNA or a crRNA : tracrRNA duplex forms complex with Cas9 protein, they can together, create double strand breaks at a locus complementary to the 20 nt guide RNA sequence, 3-4 bp upstream from a protospacer adjacent motif (PAM) sequence (5'-NGG-3'). Unlike the traditional plasmids or lentivirus delivery methods, CRISPR/Cas9 RNP are delivered as intact complexes, and do not require cellular expression, thus has many advantages. Recently, several studies have showed that sgRNA has better stability than crRNA:tracrRNA when duplexed with Cas9, thus leading to higher editing efficiency1,2. Synthesis of 100 nt long sgRNAs was traditionally possible through in vitro-transcription (IVT) using phage RNA polymerase. These in vitro transcribed sgRNAs contain a 5’-triphosphate, which was thought to trigger immune response in many cell types. A recent study showed that sgRNAs with 5’-triphosphate modifications produced through in vitro-transcription can indeed induce innate immune responses and lead to cytotoxicity in human and murine cells. However, chemically synthesized sgRNAs without the 5’-triphosphate modifications demonstrated much better editing efficiency in cells, thus supporting that chemically synthesized sgRNAs are the most ideal reagent for CRISPR genome editing up till now3. Hendel, et al., Chemically modified guide RNAs enhance CRISPR-Cas genome editing in human primary cells. Nat. Biotechnol., 33 (2015) 985-989. Ryan et al., Improving CRISPR–Cas specificity with chemical modifications in single-guide RNAs. Nucleic Acids Research, 46 (2018) 2: 792–803. Kim et al. CRISPR RNAs trigger innate immune responses in human cells. Genome Res. 2018. 28: 367-373. A minimum of 3 crRNA sequences are recommended to ensure knock-out and experimental accuracy. Independently obtained knock-out mutants provide redundancy to safeguard against any hidden off-target effects. Cells only need to be transfected once. gRNA/Cas9 expression is driven in an ideal 1:1 ratio. Dual vectors, where Cas9 and gRNA are expressed independently on separate constructs, are more suitable if you plan to express multiple gRNAs for multiplex targeting. For these applications, Cas9 should first be stably expressed in the cell line, after which the cells can be transfected with different gRNA vectors to generate a cell pool. Keep the crRNA and tracrRNA oligonucleotides tightly sealed at -20℃ prior to use and avoid repeated freeze-thaw cycles. We recommend working in a sterile environment, using RNase-free pipette tips and tubes. 1. Centrifuge tubes before opening to ensure RNA oligos are at the bottom of the tube. 2. Resuspend both oligos in Nuclease-Free water to reach the appropriate final concentration, for example,100µM. Keep the Cas9 vial sealed until use and avoid repeated freeze-thaw cycles, as either may reduce the activity of Cas9 protein. Prior to use, dilute the protein solution using a diluent buffer (10 mM Tris, 300 mM NaCl, 0.1 mM EDTA,1 mM DTT, 50% Glycerol to pH7.4 at 25℃). It is recommended to use the same amount of Cas9 protein and crRNA:tracrRNA. We have found that 3-6pmol of Cas9 protein and 3-6 pmol of crRNA:tracrRNA are sufficient for each gene editing reaction. CRISPR RNA/Cas9 Protein gene editing efficiency testing is best performed in easy-to-handle human cell lines, such as HEK293 cells. Seed well-dissociated cells one day (16-24hrs) prior to transfection in media lacking antibiotics. Incubate cells with transfection reagents. 30-70% confluency at the time of transfection is recommended, as high confluency can negatively impact efficiency. Harvest cells approximately 48hrs after transfection and extract genomic DNA for analysis.